← 9 months, and all that. 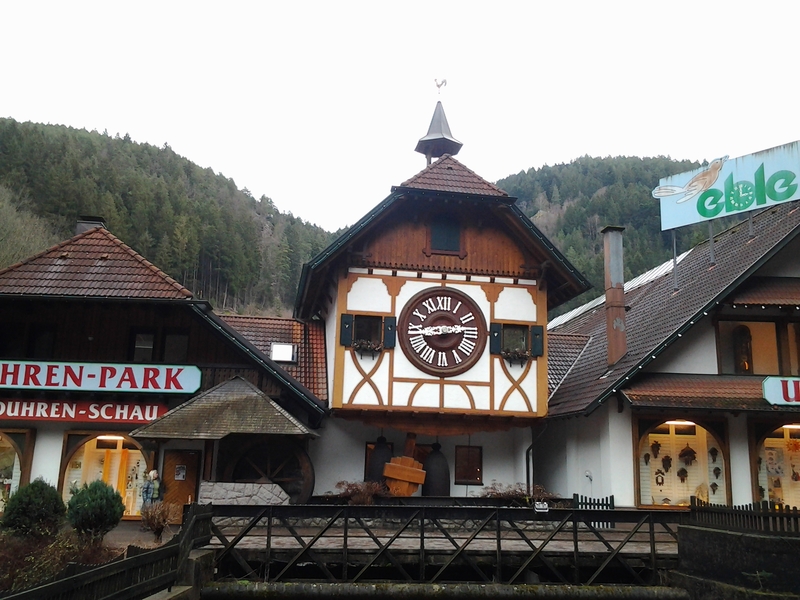 A long St Valentine’s weekend was the occasion to show my wife the Black Forest I used to live and work in years before and had talked so much about. The fact that we’d chosen St Valentine’s to go down to the Black Forest was a joint decision made, it would seem, with total disregard to all existing studies, that maintain that vacations can be potential minefields* for couples and in particular St Valentine’s holidays. Of course we’d heard about these studies, frankly more or less serious, but anyone in a sufficiently mature relationship will tell you a couple is something you work on all year round and if you don’t then maybe you shouldn’t be too surprised if you have issues come holiday time. This particular trip, though, really did have all the trappings of a classical “Defcon” situation but as it turned out it was actually one of those precious moments where a couple finds out where it stands. In retrospect I’m happy to say this was our case and the trip actually went pretty well, especially as on leaving Baiersbronn the wife declared that we’ll go again. Imagine, we didn’t even have to fight for the bedcovers, the hotel gave us one each! * Minefield? Well yes, you don’t normally go back and show your wife a chapter from an earlier life with all its souvenirs (and spectres), unless you are absolutely sure, or totally Kamikaze, about where you’re heading. But, I’m happy to say we both agreed that we probably wouldn’t be where we were today, figuratively and literally speaking, if all that had never happened. The fact that we were looking at a once proud, now despondent and rather dilapidated looking hotel definitely helped turn the page on that particular chapter. We even decided we would be going back again, proof again if needed of the level of inner harmony this particular couple has reached. 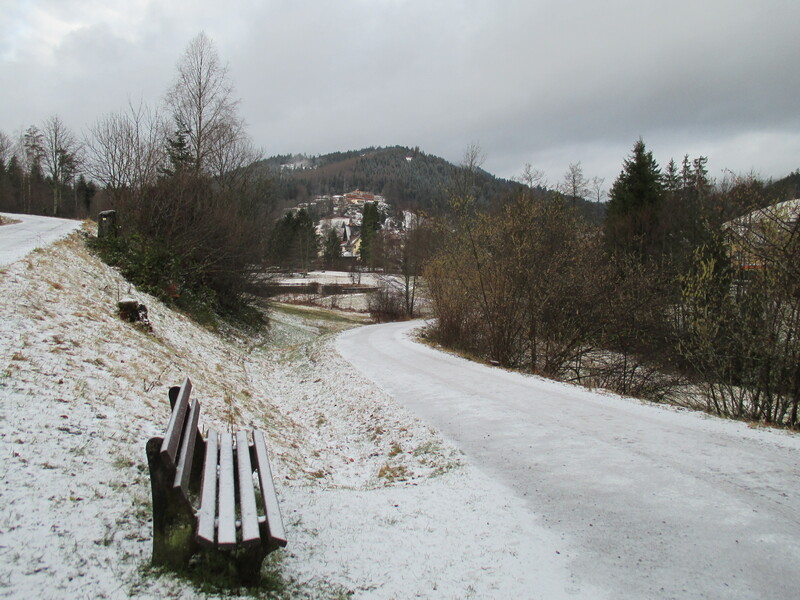 The Black Forest in winter, but where was the winter? Taking a break from a not so wintery Cologne we rented a car and drove down to a little town some 30 kilometres south of Baden Baden, just off the “Schwarzwaldhochstrasse”, called Baiersbronn*, hoping to see some snow, sadly lacking in Cologne. As I’ve already written about the hotel we stayed in I won’t go over that again suffice to say it was a nice place that we possibly didn’t see at its best, given the weather conditions at the time, storms, rain, high winds… but no snow! 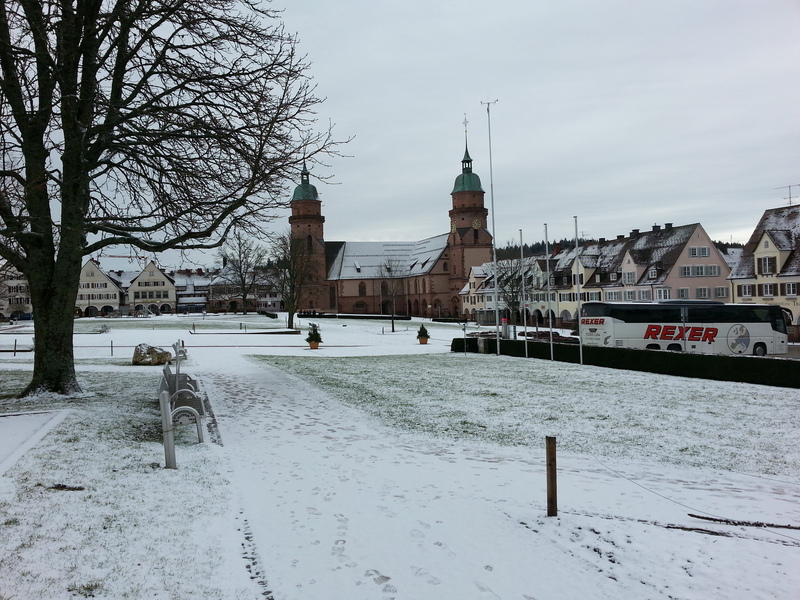 * Baiersbronn is some 10 kilometres from Freudenstadt, “The” place referred to above. 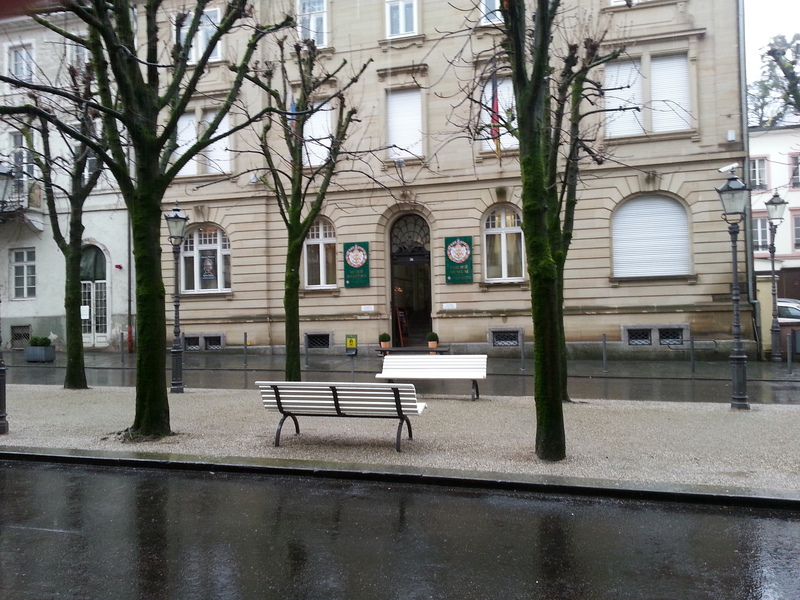 No snow? Well almost no snow, the first night it actually snowed a couple of centimetres, which was enough for us to take some rather “Trompe l’oeil” photos, the next morning before breakfast, showing Baiersbronn the way it should have been had it not been for “Global warming”. Ah, Global Warming! Some schools of thought are saying that “Global Warming” is not simply the result of man’s mismanagement of natural resources and so on but part of a bigger picture, etc, etc. Somehow the debate leaves me contemplative. Yes its undeniable that ‘Once in a century” severe weather and geological phenomena now happen every year leaving man sadly fragile and confused and yes its undeniable that one day cities like New York, Miami and Rotterdam will be submerged but if the long overdue explosion of the Yellowstone Caldera were to happen tomorrow (these happen once every 650 000 years and the last one happened almost 700 000 years ago) then the debate would be rather null and void, wouldn’t it? Well at least there is some good news in all this. Apparently man’s been through it before and came out stronger. So, ok, this time man will lose all his technological toys and all the so-called “Preppers” will eventually run out of stocks and ammunition but mankind with its collective memory and its faculty to adapt will still be there. One point that did become apparent during our rainy stay at Baiersbronn was that because of the lack of snow tourist boards in places such as Baiersbronn and Freudenstadt, at an average altitude of ± 600 metres, were having to be inventive and “Green Tourism” , once only promoted after the ski season ended, was no longer just a Plan B to skiing but a rather important parallel activity, whatever the season. Resorts such as Kniebis, Mummelsee or Ruhestein, peaking at ±1100 metres, would always be there for skiing, but back-packing, hiking, bus trips to near-by glass, clock or Black Forest ham factories and museums were gaining ground, so much so that our hotel even provided us with a free public transport pass for the duration of the stay! Another thing we found we had been time. Time to talk with people who took the time to talk, face to face and not via Skype, Viber, Twitter etc. Normally, like most people I guess, I’m not talkative before my morning coffee which, like most people, is then followed by 30 minutes of reading a variety of more or less Hair-brained news articles on the web while I really wake up, following which its off to work where, again like most people, I’m either too busy to talk or its the people around me who are too busy to talk so we doubly appreciated the chance to another person about things so totally alien from normal day-to-day topics. At the hotel, and in spite of good WiFi connection, we literally disconnected and took the time to talk to each other and to others around us, starting with the owner/manager, a certain Mr Jürgen Weidenbach, who prepared breakfast for us. In reality we let him do most of the talking which was really interesting, because without divulging the hotel’s bottom line we got an interesting insight into the workings of a rural hotel in the German Black Forest, from the servicing of the hotel’s radiators to the altercations with the local mayor because of the flooding the hotel’s cellars were regularly subject to before the hotel acquired a pump. NB. What was ironical in all this was that I learnt the owner and I had a common acquaintance, a local lady who had worked with me at the Hotel in Freudenstadt all those years ago and where her husband, sadly now deceased, was head chef! Small world! Back in Cologne, refreshed and re-oxygenated, it was time, at last, to close one phase of my administrative labours. The re-registering of my foreign reg car with the local administration had been dogging me for some time. Sparing the details a technical control, several times postponed, was my immediate preoccupation, which for a 13-year-old car, if the changing of the on board computer was anything to go by, can be a financial black hole. Like I said this had been dogging me for a while now and when the day of the technical control finally arrived I felt like some nervous exams candidate, which in retrospect I was. It should have been a formality and almost was, except for 2 small points: a defect back seat belt lock and a trace of oil, yes just a trace on top of the motor, where you pour the oil in. The inspector told me if I could get the seat belt repaired, and wiped the motor oil clean, that same day I could come back and re-submit the car for inspection, free of charge. Well after paying out €136 for the first visit, the offer was not to be refused. But I had a problem. How was I going to repair the defect back seat belt lock? Well you’d be surprised just how ingenious man can be when he puts his mind to it and the smile on my wife’s face when I told her I had fixed the seat belt was ample reward. This also reinforced my conviction that if I could repair a simple seat belt imagine what else I could do if I put my mind to it! Epilogue. I was finally able to obtain the required official stamp confirming that my 13-year-old car was road-worthy. Next step. Get my car out of mothballs, re-register it with the local administration and plan new trips. Naturally all this only made my wife’s smile larger. I could just see her imagining all the things we were going to be able to do come spring… Karma and inner harmony, dude, Karma and inner harmony! 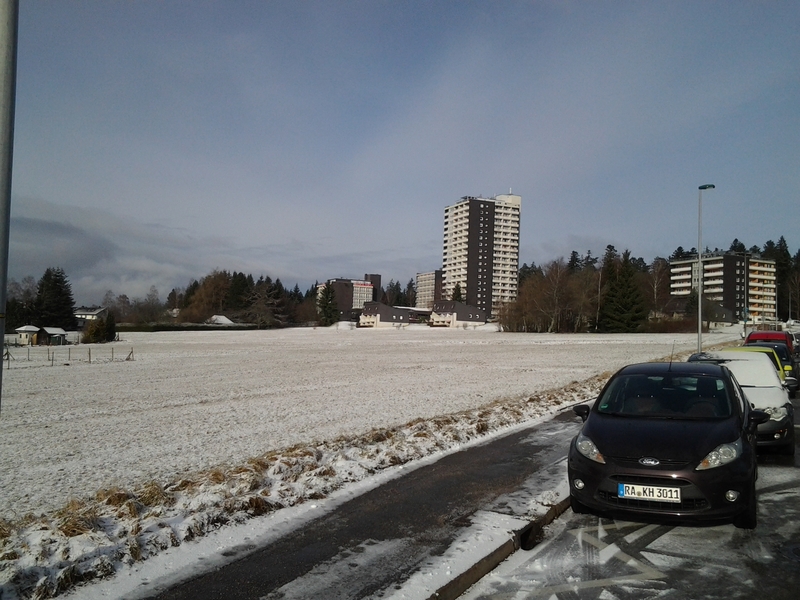 This entry was posted in Everyday life, Society, Voyages and tagged Baiersbronn, Freudenstadt, Schwarzwaldhochstrasse, Twitter, Yellowstone Caldera. Bookmark the permalink.